The OCTAGONAL BLENDER is an efficient and versatile blending machine for mixing and lubrication process of dry granules homogeneously. Two third of the volume of the Octagonal Blender is filled to ensure proper mixing. The Octagonal Blender gives best result for granules due to very slow speed and octagon shape of container. It can be used for Pharmaceutical, Food, Chemical and Cosmetic products etc. 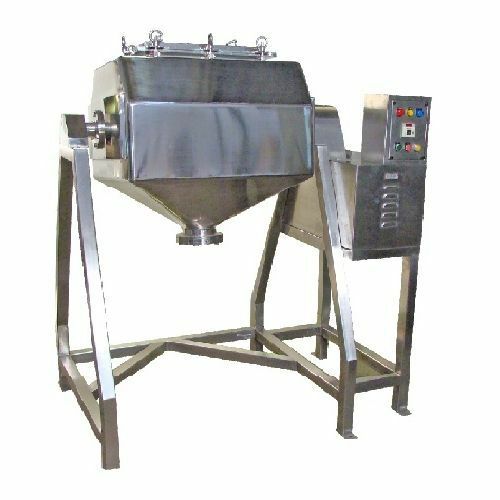 In Octagonal Blender the granules comes from all sides due to the octagonal shape of the product container, hence requirement of RPM is less. Suitable mainly for Crystalline & Granular type material. This type of material gets sufficient continuous movement due to their shape if container have only slow movement and will results in good quality of blending / lubrication of granules. Octagonal Blender is Suitable for dry mixing of products in granule form. Easy for loading and unloading of material. All contact parts of the Octagonal Blender are made out of SS 304 / SS 316 or SS 316 L quality material, as per customer requirement. The octagonal shape & slow speed of rotating gives sufficient continuous movement to the granules, result in good quality. Simple design Octagonal Blender requires minimum maintenance. .
General structure & safety guards made out of mild steel & coloured in Standard Model and made out of SS 304 & polished to the matt finish in GMP Model. E-mail: ambicaboiler@gmail.com Home | About us | Contact us | Link Us |Sitemap.